Before you think I still have turkey left, I made this over two weeks ago! Every December my husband insists on ordering a Norfolk Black turkey from our local butcher. There are generally only four of us for Christmas dinner with one or two sets of guests over the following few days – two of whom are vegetarian anyway. So it becomes an annual debate whether we can justify buying a 12lb turkey given that I don’t enjoy fiddling about with it afterwards. Whilst I boil and pick at chicken carcasses throughout the year, the ritual of dealing with the Christmas bird’s bones and greasy bits does not amuse me one bit. I hate the smell of turkey stock bubbling away and can’t bear fishing it out of the water afterward. Weirdly with chicken I have no qualms with mucking about with turkey bones is a chore I hate. I love my leftover turkey cold in sandwiches. I’m happy to have it in pies or rice salads. But I’m not a huge fan of turkey curry made from left over turkey. And I don’t like stashing supplies of frozen cooked turkey to resurrect a few months later. I love serving turkey during the year when you use strips of fried breast fillet that keep their shape in chunks. Cold roast turkey relentlessly stirred in a post Christmas curry seems to break up into threads and disappear. I don’t mind this effect in a risotto but it doesn’t seem right to me in curry. Cold roast turkey does however behave itself in stir fry. I think because the meat gets coated in a light sauce and briefly tossed with the vegetables it doesn’t have chance to disintegrate. So if not curry, I am pleased to add this oriental turkey leftovers dish to our family’s post Christmas menu. It occurs to me you could make it truly Christmas leftovers themed by using stir fried sliced sprouts but since I already opened this new blog with two sprout recipes I should them them a break for a bit. I say this serves one or one and a half since it was just the right amount for myself and five year old Ted to enjoy for supper but Nick ate the same amount on his own. Serves 1 or 1 and a half. 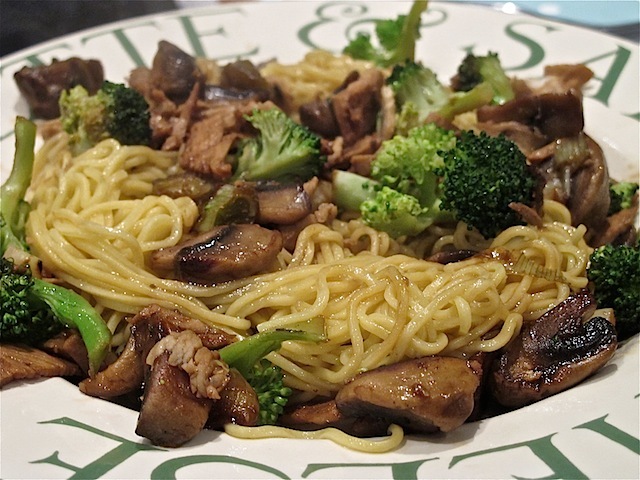 2 tbsp Teriyaki sauce – I used Clearspring. 1. Boil the kettle and fill a small saucepan in which to soak the noodles. Bring the water back up to the boil and then reduce to a simmer with the lid on for a few minutes. 2. Meanwhile in a frying pan heat the sesame oil and fry the spring onion lightly. Add the mushrooms and broccoli florets. (I speed up the cooking of my broccoli by giving it a blast in the microwave for two minutes first). When the broccoli is cooked, add the cooked turkey and teriyaki sauce. Stir until everything is coated and heated through. 3. Drain the noodles and add to the frying pan. Toss the vegetables in the hot noodles. Add more teriyaki if you feel the dish isn’t wet enough but take care not to add too much. Serve immediately sprinking over some sesame seeds if your husband/child does not have an aversion to small round things. (It’s complicated). Enjoy – it’s a good storecupboard recipe.